Colonial Virginia Council held their annual Eagle Scout Recognition Banquet on March 20, 2010 at the Omni Hotel in Newport News. The Banquet honored the Eagle Scout Class of 2009, and a unique patch in the shape of an eagle head was issued to commemorate the event. 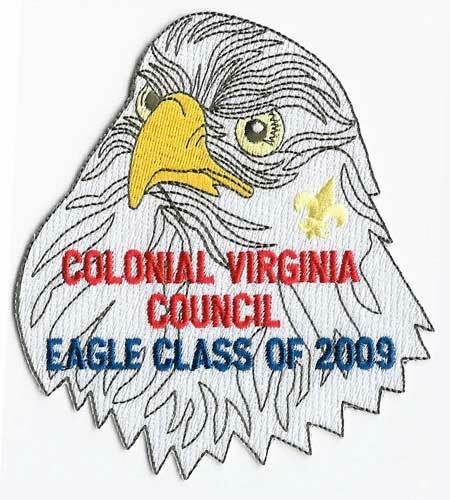 CVC Eagle Scout Banquet patches were issued in 2006, 2007, and 2008 and were shaped like a standard council shoulder patch (CSP). You can find them listed on the Colonial Virginia Council Shoulder Patches page.